Will liberty prevail at the U.S. Supreme Court? Graphic: Illinois Family Institute. 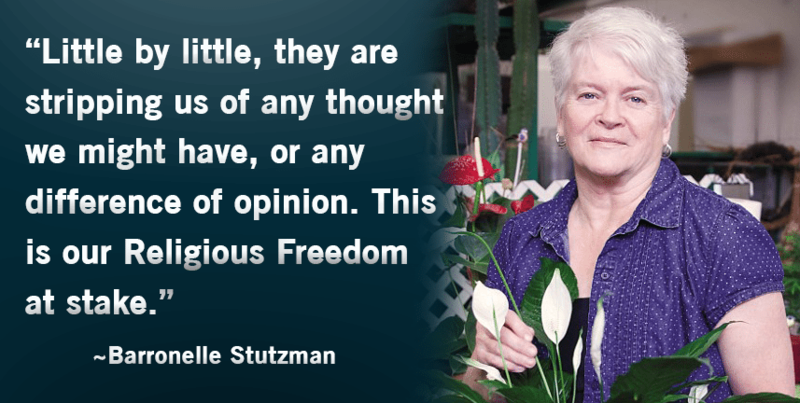 Folks, it looks like the case of Barronelle Stutzman–the Christian florist who was sued by two “marrying” homosexual men and the Washington State Attorney General because she would not create a floral arrangement for their “wedding”–is headed to the U.S. Supreme Court. Below is a background video on Barronelle’s case created by ADF. You will note from this 2016 court filing that ADF et al are defending Stutzman on “artistic freedom” grounds. We at AFTAH are not attorneys but we do know this: in a free society, anyone–Christian florist, Muslim cake-maker or atheist wedding chair-supplier–should have the liberty not to use their business to celebrate homosexuality-based “marriage,” which we, as Christians, regard as sin on steroids. After hearing about Barronelle’s decision in the news, the Washington State attorney general decided to take matters into his own hands, and sued her. The ACLU followed close behind. Both lawsuits attack not only her business, but Barronelle personally. Alliance Defending Freedom asked the court to dismiss the attorney general’s lawsuit since he was not personally involved in the incident, and filed a countersuit against him. They also asked the court to protect Barronelle from personal attacks from the ACLU and the state, and restrict the lawsuits to her business, Arlene’s Flowers. In February 2017, the Washington Supreme Court concluded that the government can force her—and, by extension, other Washingtonians—to create artistic expression and participate in events with which they disagree. Barronelle says she will ask the U.S. Supreme Court to reverse this decision. This article was posted on Sunday, February 19th, 2017 at 11:43 am	and is filed under "Civil Unions" & "Gay Marriage", "Sexual Orientation"/"Gender Identity" and the Law, A - What does the Bible say about homosexuality?, Biblical Truth, C - Heroes for Truth, Christian Persecution, Freedom Under Fire, Government Promotion, News, The Bible, Churches, & Homosexuality, US Supreme Court, YouTube videos. You can follow any updates to this article through the RSS 2.0 feed.